Some posts are very very special, the one today is same. Kind of post that you write when you can’t find words because they are just not enough to describe how you feel. Feeling that swells your heart, you feel lost, everything looks surreal and you are just floating. Its ecstasy? I am not sure. 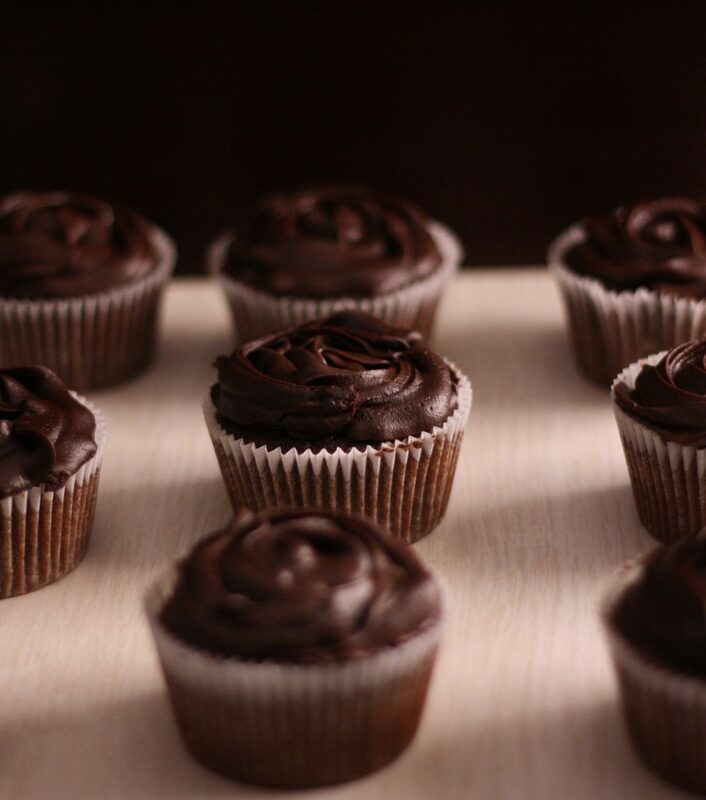 Followed by Moist Chocolate cupcakes with Easy Fudge frosting recipe. I cannot say that I have always been lucky to have friends. I was more on introvert side, quiet and nerdy type. Since my university I started to pickup because that was the time I met my bestie. Now after almost 18 years, I am super fortunate to have an army of friends I count on. The other day my daughter was asking, who is your best friend and I said I have 8 best friends and the look she gave, well you can guess what it would be like from a pre-teen struggling with acceptance and peer pressure. It is so easy to explain science but I find it so difficult to explain how this friendship thing works. There is no blood relation, no compulsion, yet you make it work and find comfort in it. It is not only about good times, its about who you call in tough situations, who can guess from just your face (albeit tons of makeup) that something is wrong. Who can feel you are irritated and who can guess what you will love. Who can throw the most amazing surprises (man I love surprises) and who can be a tender shoulder to cry on. Who can pick you up after a good laugh when you have fallen. Who just messages you when you even think of them and who just genuinely loves you. Who will travel just to see you for a couple of hours and who will just adjust their traveling because you need them. Its about who goes against all odds to make something happen for you and who will always hold you accountable out of their sincere concern. Friends who will remind you for your supplements and will give a missed call for sehri/sahoor in Ramzan. Who will give that confidence to wear certain styles and will help you rock it. Those who will not hesitate to show you the mirror and will give you a relentless push in the pool. Who are like your rock to lean on so you don’t loose balance, you open to them with belief that they will sort things out with you without even minor judgement. Whom you think about in prayers and you know you are in theirs. Who know your needs better than you and who are so proud of you. Who are cheering for you and screaming from the front row. Who promote your business through their own and hold your hands. My dear readers, if you have even one such friend, you are blessed. You totally are. Treasure it, protect it and cherish it. My friends are not only from same/different cities but countries, even continents. Yet we rock it. I was handed over this book by Dale Carnige “How to win friends and influence people” and though it has some great tips and is a best seller, it didn’t work for me somehow. What worked, I don’t know and I can’t even figure out. I am just blessed and they are my asset. Who they are, I am sure they will kill me if I take their names but I know they are reading and smiling now. They know what they did for me from the above. Hey you guys, listen up, you are my gems, very precious ones. I hope and pray that I am able to be even slightly useful and caring for them, loving them the way they do for me. 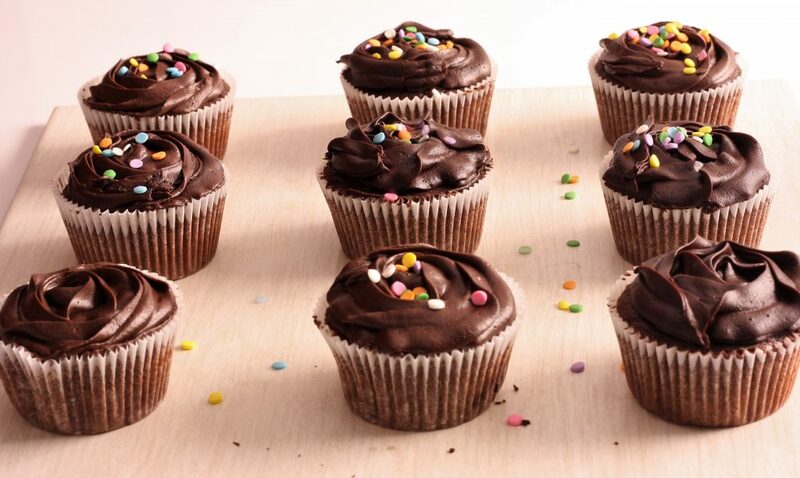 Onto a very special recipe of cupcakes, my always goto with fudge frosting and some sprinkles. Don’t be scared with a little runny batter, use the 1/3 cup measurement to pour in the liners. Rest of the ingredients and process is pretty simple and straight forward. 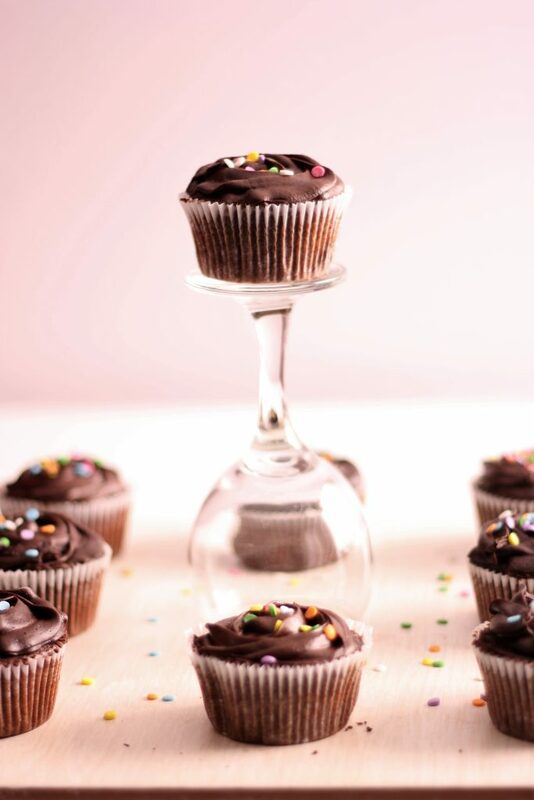 if you don’t have tip and pipe bag, just use a palette knife to slather that amazing frosting on cupcakes. Its moist, with tender crumb, and amazing fudge frosting passed on to me by me dear friend Shazia who guest blogged the moistest carrot cake here and finger millet stuffed buns here. Her page on Facebook is a great resource on quick snack items which you can check here. Line 16 cupcake liners in muffin trays. Dissolve cocoa powder in water. Add vanilla and continue to beat. Add in the batter and beat at lowest till mixed. Add the cocoa powder mixture in the batter and beat until mixed. Take 1/3 measuring cup from the batter and put in each liner. Bake for 15-18 minutes until just done, and upon lightly touching its not wet. 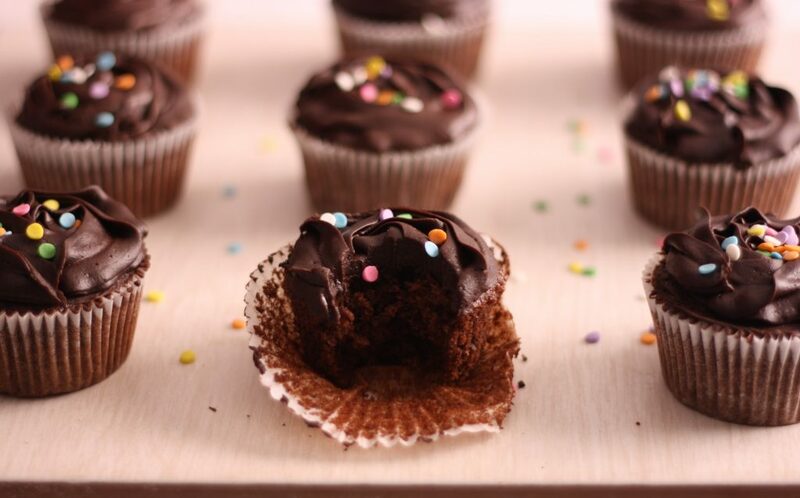 Take out of muffin pans and cool completely before frosting. Add in rest of the ingredients and beat. Refrigerate for 15 minutes till set to piping consistency. 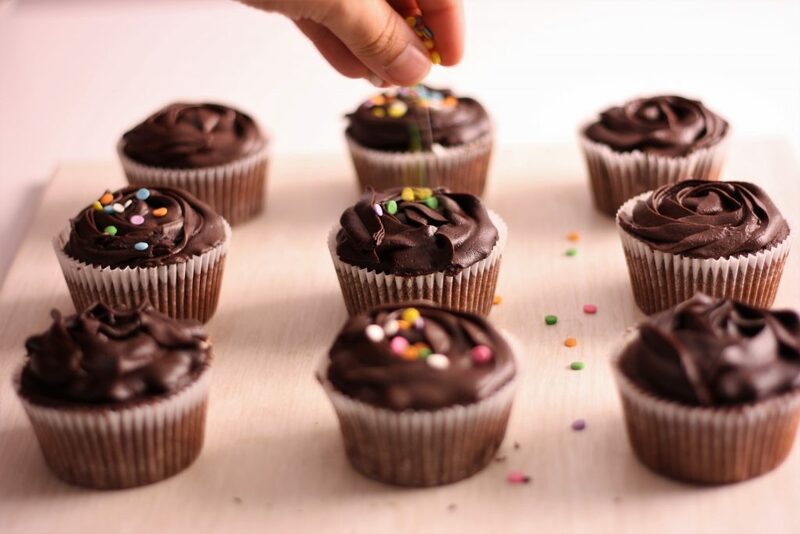 Use 1M Wilton tip to pipe the swirls on cupcakes. Store in fridge in a box but bring to room temperature before serving. You can freeze the un-frosted cupcakes in an airtight box, after cooling. Again wrap the box in plastic bag and defrost on counter for a couple of hours before frosting. 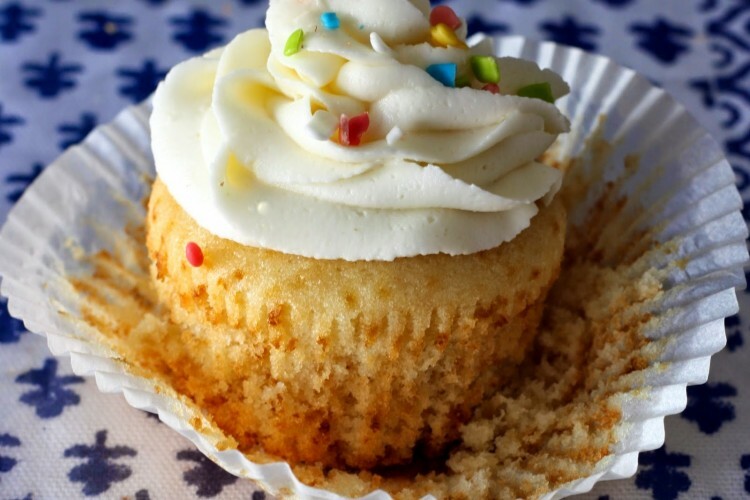 Looking for Vanilla Cupcakes, here is my favorite one.